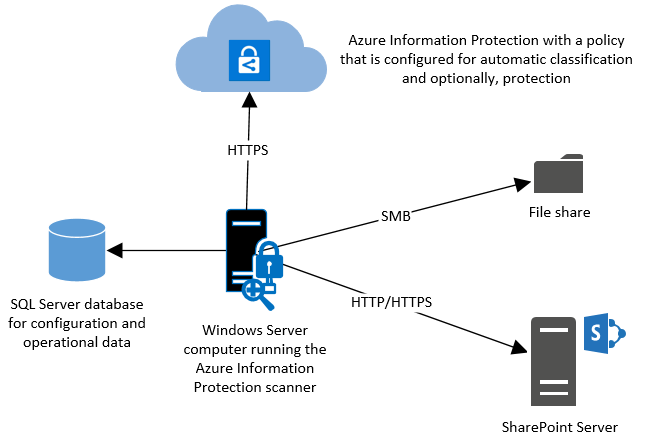 The Azure Information Protection Scanner is a program designed to detect, classify, and optionally protecting documents stored on File Shares and On-Premises SharePoint servers. The overview below is from the official documentation at https://docs.microsoft.com/en-us/information-protection/deploy-use/deploy-aip-scanner. This blog post is meant to assist customers and partners with deployment of the AIP Scanner. If there is ever a conflict, the official documentation is authoritative. UNC paths for network shares that use the Common Internet File System (CIFS) protocol. Sites and libraries for SharePoint Server 2016 and SharePoint Server 2013. You can run the scanner in discovery mode only, where you use the reports to check what would happen if the files were labeled. Or, you can run the scanner to automatically apply the labels. NOTE: The scanner does not discover and label in real time. It systematically crawls through files on data stores that you specify, and you can configure this cycle to run once, or repeatedly. This blog post was written based on the 1.29.5 version of the AIP Scanner. Every effort will be made to update it when things change, but if you run into difficulty running any of the commands on a newer version, please use the official documentation to identify any changes. NOTE: TL;DR: More RAM is better. The scanner will allocate RAM 2.5-3 times of size of all files being scanned in parallel. Thus, if you scan 40 files that are 20MB each at the same time, it should take about 20*2.5*40=2GB RAM. However, if you have one big 1GB file it can take 3GB of RAM just for that file. NOTE: We have scripted the scanner installation process and it is now available at https://techcommunity.microsoft.com/t5/Azure-Information-Protection/Azure-Information-Protection-Sca.... Although these steps are still valid, the scripted method is far less prone to mistakes and much faster for deployment. A basic installation of the AIP Scanner service is simple and straightforward. NOTE: If you get any errors at this point, verify network connectivity and resolve any permissions issues with the SQL Database before proceeding! After the install of the AIP Scanner binaries, you must authenticate with the AIP Scanner Service Account to get a token for use in automated discovery, classification, and protection. Click on the Start menu and type PowerShell, right-click on the PowerShell program, and click Run as a different user. Now that the scanner has an authentication token, we should discuss what you want to do with the AIP Scanner. We know that you want to use it to scan file shares and SharePoint sites, but some discussion needs to be had about how the scanner locates data and what the scanner will do once it finds it. AIP Policies contain Labels and Sub-labels that allow you to classify and optionally protect data. You can assign conditions to these labels using standard Office 365 DLP templates and have those conditions be recommended or automatic. For the AIP Scanner to classify documents, you must set these conditions to be Automatic. This allows the AIP Scanner to protect content without the need for user input. This is a content based approach and labels are assigned to content based on the conditions defined in each label. If you want all of the documents in your repositories to be classified, then you can use the default label setting in the portal and the AIP Scanner will assign that label to any content that does not meet any other automatic criteria. This is done in the Global policy blade, under the Configure settings to display and apply on Information Protection end users section. NOTE: Use caution when using a default label as this will label any file that is not caught by properly defined conditions. This could potentially result in improper classification of many documents if not tested appropriately. Repositories can be on-premises SharePoint 2013 or 2016 document libraries or lists and any accessible CIFS based share. NOTE: In order to do discovery, classification, and protection, the scanner service pulls the documents to the server, so having the scanner server located in the same LAN as your repositories is recommended. You can deploy as many servers as you like in your domain, so putting one at each major site is probably a good idea (Microsoft currently uses around 40 Scanner instances worldwide for internal repositories and will be expanding that to 240). One of the most useful features of the AIP Scanner is the discovery of sensitive data across all of your configured repositories. You can do this by using Set-AIPScannerConfiguration with a switch called -DiscoverInformationTypes. When this switch is set to All, the scanner will discover files that contain any data in the list of all Office 365 DLP sensitive data types, and any custom string or regex values that you have specified as automatic conditions for labels in the Azure Information Protection policy. When you use this option, labels do not need to be configured to use any conditions for the Office 365 sensitive data types, but you will need automatic conditions configured for custom string or regex values. NOTE: The labels for the custom values can be applied to a policy scoped just to the AIP Scanner service account if you do not want them triggering on your global labels. The PowerShell command below will allow you to scan your repositories against all information types. After running the scan, you can review the logs by opening the Azure Information Protection event log or you can view the detailed logs at C:\users\<Scanner Service Account Profile>\appdata\local\Microsoft\MSIP\Scanner\Reports. There you will find the summary txt and detailed csv files. Running this command on your defined repositories will show you all of the sensitive data types you currently have in those repositories. You can then use this information to define conditions on labels so you can properly classify and protect your content. Once you have your conditions defined, type the PowerShell command below to enforce protection and have the scanner run once. NOTE: After testing, you would use the same command with the -Schedule Continuous command to have the AIP Scanner run continuously. NOTE: The -Type Full switch forces the scanner to review every document. You should now be able to review the event log and AIP Scanner log files to see what files have been classified and protected. The last item you will want to do is set the scanner to continuously monitor the repositories you have defined for new content. This can be done using the PowerShell commands below. You should now have a fully functional AIP Scanner instance. You can repeat this process on multiple servers as necessary and use the same Set-AIPAuthentication command for each of them. This is a simple setup for a basic scanner server that can be used to protect a large amount of data easily. I highly recommend reading the official documentation on deploying the scanner as there are some less common caveats that I have left out and they cover performance tips and other additional information. First, Thanks for your quickly reply! but I have more just one question. Upload my SQL Server information photo. You see my SQL Server information and tell me how to install AIP Scanner! Based on the SQL settings in the picture it appears that you should be able to simply use the local server name when asked for the SQL Server. I think my problem is wrong use 'Service Account' in Prerequisites. Can you explain how create Service Account for me? The Service Account is an account you create on premises and sync into Azure AD. It requires the rights as explained in this article but these are standard and should not be a problem in most environments. I'm sorry to ask you again and again. I'm created local user in AD server and added SQL server logins user(is mean Log on as a service. right?). How grant Read/Write permission to Service Account. I had difficulty creating a service account, but I set up a service account in a security policy called 'secpol.msc', and then I set up a login to the corresponding AIP-Scanner service account with local group policy editing. Now it works. Thank you for helping us set up so far. I am glad to see you got past your initial issue which appeared to be that the AIP Client was not installed before you attempted to run the Powershell Install-AIPScanner cmdlet. The current error you are having appears to be due to a network or permissions issue with the SQL server. Please ensure that the account you are logged in as when running the install command has sysadmin rights to the SQL database and good network connectivity. You may want to install SQL express locally as the install account as that would solve both issues. I am using same Server for AIP Scanneer & SQL Express 2017 installed on it. Not sure why i got N/W related Error. I am using default SQL Instance given most permissions to Master DB please let me know if anything is missing. Service has come up but not running is it common behavior. I will wait for your response before i proceed further. Set-AIPAuthentication : Error acquiring token"
@AmanDeep Singh This is most likely because on step 20 you didn't set application type to Native. Create a new App and try again. To be sure I recreated my API as described above. Tempted to try the preview of the AIP scanner to see if the issue persists. Edit : Upgraded to latest preview client same issue. first of all thanks for your article. I have one Question regarding the rescanning with AIP Scanner. What happens if a document is labled, gets relabled (more or less confidential) by a person in the Company and the AIP scanner reruns? Will AIP scanner relabel the document according to its policies or will it detect the Change and accept it / skip the file? Will AIP Scanner be able for end user devices as well? Do Microsoft have a road map for this? Windows Defender ATP already has some capabilities in this regard (detection of existing labeled content) and we will be investing on enhancement of endpoint detection via this mechanism. Please watch for more announcements in the future on this blog around these capabilities.